One of our most popular event types that we do are fundraisers and charity events. No matter the cause, fundraising is a challenge. Planning and executing a good great fundraising event takes a lot of planning and resources to make it happen. After 15 years of helping individuals, charities, not for profits, various organizations and ourselves doing countless fundraisers, we are sharing some tips on making your event a success. 1) Don’t wait until the last minute. Too often we see organizers planning their fundraiser with only 1 or 2 weeks before the event date. What this does is, it leaves very little time to promote your event through media and get the items and attractions that you would want. This point would be recurring as you would see it ties into several of the other points down below. Give yourself at least a month to get your event organized! To raise funds any event requires foot traffic. Getting the word out about your event in advance will help maximize reach. Use as many channels as possible to promote your event. There are many free options to choose from. We suggest that event organizers can start with the press. Newspapers are likely to do a write up about the event, include it in their events section, and distribute the information in the paper and online. Get a local radio station to talk about your event and possibly do a live broadcast on the day of. It’s sure to get you a lot of exposure. Also, make sure to make a Facebook and an Eventbrite event. This will give you an estimated number of people attending. Keep in mind, only 30-50% of Facebook attendees will show up. The Animal Kingdom Toddler Unit is great for ages 2-6. 3) Target Families, especially children. One benefit of a fundraising event is that it can provide a low cost entertainment for the entire family. You can either charge for admission, charge for your attractions or have a combination of both. When considering inflatables, you can have it all covered with your admission fee or do a ‘Pay per play’ model where a 3-5 minute ride on an inflatable would cost between 2 and 3 dollars. When doing this, make sure that you have entertainment for all age groups. Here are some recommendations. 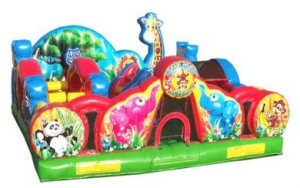 What we like to suggest for children ages 2-6 are inflatables such as our toddler units. These bouncy castles for small children are perfect for those who are now getting their sea legs and not quite big enough to play with the older children. Toddler units usually have bright colours, interactives, small slides, and low walls. The low walls on these units are important as they allow parents to easily watch their children. There are lots of entertainment options for children. From bouncers, to obstacles, games and interactives as well as entertainers such as clowns and face painters, there is always something to entertain this demographic. Make sure then when you are promoting your event that you highlight your attractions as this would generate you the most foot traffic. For Teens, Adults and All Ages. Tugga Touchdown is a great interactive for adults and teens. Entertaining for this demographic while maintaining a family friendly atmosphere is sometimes a challenge. Some families may have teens and tweens that are ‘too cool’ for these ‘kiddie’ events, but by having some entertainment for them your fundraiser can truly be a full family entertainment event. Obstacle courses and interactives are a big hit among teenagers and even some adults. What is an event without something to eat? With high energy activity, providing options for a refueling snack is a great way to raise some quick cash. The classic popcorn machine rentals, cotton candy machine rental or snow cone machine rental are easy to operate and provide low cost options for your food and maximum profits. 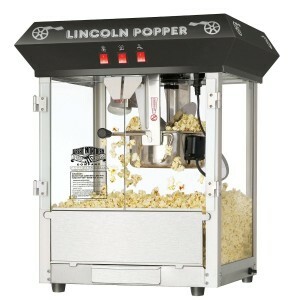 Consider this, the standard rental price of a popcorn machine is $99. Serving 100 bags of popcorn would cost you $50. Selling each bag at a the low price $2/bag would net you $31.63. Now this does not seem like a lot but if you had a reasonable 800 popcorn sales throughout a day or weekend event, profits would be over $1000. Tip 1: Don’t sell your fun food at the location with cash. Have a ticket sales booth and fun food machine operators will take tickets. It removes the hassle from operating and providing change where there are most likely line ups. 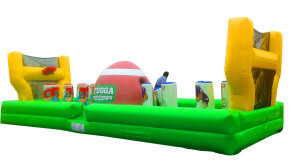 Tip 2: When renting a bouncer and a fun food machine, ask us about our packages for fundraisers. For example: We have our Mega Deal Combo where you rent 2 standard bouncers and a fun food machine and get 50 servings of fun food for only $499. That saves you over $70 on your machine, making your event even more profitable. In a pinch you can hire our staff to operate. Volunteers are a great way to save money on your event. They allow you to make it bigger, the organizer can focus on running the event, and you save on staff costs. Send out your volunteer requests to high schools and local business organizations such as your local chamber of commerce. It never hurts to have too many volunteers. In a pinch, you can always hire staff one of our to operate a bouncer or fun food machine for you. Note: If you are having your event at a public park, a school and some private establishments such as churches, you may be required to have some of our staff on site for insurance purposes. Put a politician in a dunk tank for extra fun. Invite your mayor, local MPs, Councillors and local celebrities. By having these notables at your event, they will most likely talk about it before hand, increasing your exposure and bring a crowd. Point 1 is important here as they have busy schedules. Booking them early is important to having them come to your event. Have an opening ceremony where the Mayor discusses your cause and makes a presentation. You can even raise funds by putting them in a dunk tank and charging to throw a ball. This works especially well if they are a politician! Hopefully these tricks and tips set you off on the right track to successful fundraising. 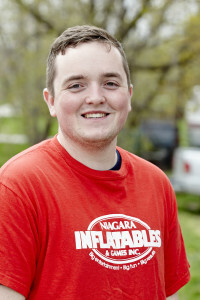 If you are planning a fundraiser or any other event and would like us to help, make sure to send us a request or call Niagara Inflatables & Games at 905-646-JUMP (5867) and chat with one of our experienced event planners.